We hand build acoustic guitars to custom specifications for those who are looking for reasonably priced custom built guitars that far surpass the quality and sound of an “off the shelf” guitar. 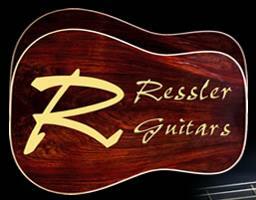 Ressler Guitars also builds a variety of folk instruments including Pickin’ Sticks, Mountain Dulcimers and Hammered Dulcimers. After numerous requests from others to teach guitar building, John Ressler began teaching the guitar building craft at his home workshop. This eventually led to requests to teach guitar building workshops throughout the country. His passion for learning and passing on his knowledge to others has led him to teach Guitar Building classes at the Marc Adams School of Woodworking as well as occasional workshops at his home workshop. 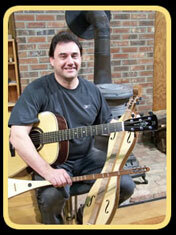 In 2010 John had his first book published titled “Pickin’ Stick: Building a StringedInstrument by Shiffer Books. "I have been woodworking and playing guitar most of my life. I'd often thought about combining interests and building a guitar. I even started building one many years ago, but ran into problems I didn't know how to solve. When I finally signed up for a class with John, it all came together. It was the best week I've ever spent and the instrument I came away with was better than I'd imagined it could have been. To say I was inspired is an understatement. Thank you John." "Over the years I have taken a lot of woodworking courses from schools and instructors all over North America. John’s courses on Making an Acoustic Guitar and Making a Pickin’ Stick are the two of the best courses I’ve ever taken. I was surprised and impressed with the quality of the instruments leaving John’s classes. He prepares more thoroughly than any instructor I’ve ever seen and in my opinion that is directly related to the outcome of student projects. Every step is outlined and planned so that every student will be successful. John’s extensive knowledge and experience and his easygoing teaching style made it a pleasure to be in his classes. I’m looking forward to my next class with John!" John Ressler’s passion for building fine custom built guitars and other steel stringed instruments was a natural progression of a lifetime of woodworking starting with his own shop on the family farm as a young boy. A stair builder by trade, he has spent much of his life designing and building custom stairs, furniture and one of a kind woodworking projects. Always curious, John was drawn to building custom guitars, as well as other folk instruments, which fulfills the challenges of fine woodworking, precision joinery and music all in one package. Building custom guitars, dulcimers and other folk instruments currently occupies much of John’s time away from stair building. He has produced dozens of custom instruments over the past decade and has taught this fine art to more than 100 first-time instrument builders.